It seems that the vast majority of the Earth’s population – myself included – have been content to consume large quantities of a neuroactive drug without really knowing what it’s doing or how it works. All of us are hooked, to the extent that we often roll out of bed experiencing withdrawal and can’t function until we get it. It sounds like something out of science fiction, but in fact it’s reality: the vast proportion of us rely on a morning cup of coffee simply to motivate us out of bed and we’re happy to continue this pattern despite not really knowing that much about how it causes the effects we’re all so dependent on. I love coffee and tea and that makes it hard for me to be objective about these matters. Still though, looking at the evidence it appears that caffeine may have a number of negative effects on the brain and also the body – even leading to weight gain. Below is a very straightforward, honest and detailed explanation of how caffeine affects the brain and body. As you can see there are some definite advantages as it can help you to get through a tired hour at work and to increase attention. It can aid learning and memory and it may even facilitate brain plasticity. At the same time though, it also ramps up your body artificially which can lead to exhaustion and it can increase cortisol and insulin levels too. Read on and come to your own conclusions as to what place caffeine should have in your life. 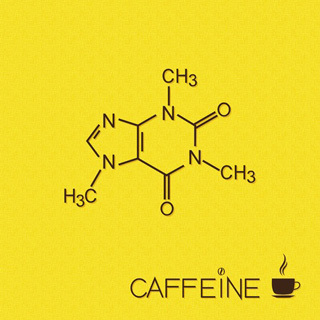 Before we can understand how caffeine works, we first need to get acquainted with a substance called adenosine. Adenosine is a ‘purine nucleoside’ that is pretty important for us humans. It is used in energy transfer throughout the body (in the nucleotide ATP – adenosine triphosphate where breaking bonds between adenosine molecules releases energy) and is also important for signal transduction. On top of all that it is also a vasodilator, meaning that it widens the blood vessels allowing more blood, oxygen and nutrients to get around the body. In the brain this stuff acts as a neuromodulator which is used to promote sleep and reduce arousal. Throughout the day we produce more and more of this adenosine and as this is picked up by the adenosine receptors of our neurons, it tells the brain to slow down and to fire the old neurons a little less as you wind up ready for bed. This is probably quite an important function, because sleep allows your brain to cement what you’ve learned during the day while making repairs. The role of caffeine is to block the adenosine ‘A1’ receptors (which it does because it’s able to fit into them by mimicking adenosine) thereby meaning that the adenosine fails to be effective. Caffeine is an A1 antagonist. Glutamate: Glutamate is the main ‘excitatory’ neurotransmitter in the brain. It plays a role in the long-term potentiation (a persisting stronger signal between two neurons as a result of simultaneous stimulation – one of the components of neuroplasticity) of the brain and is important for memory as a result. This may be why caffeine can aid leaning. Dopamine: Dopamine is a neurotransmitter that plays an important role in motivation and reward. Our brain releases dopamine when we do something that’s ‘good for us’ and this helps with learning too and in particular the reinforcement of particular behaviours. Note though that the connection between dopamine and reward is actually quite complicated and a lack of dopamine doesn’t mean you won’t enjoy things – it just helps to cement the associate between and action and a reward. Interestingly though, dopamine also gets released when you have a ‘near miss’, reinforcing behaviours that almost worked last time. All this reward stuff is due to the action of dopamine in a specific area of the brain (the mesolimbic pathway) where the D2 receptors are located. D2 receptors are affected by several stimulants and are also linked with psychosis – though caffeine is unlikely to trigger any psychotic bouts! Caffeine also stimulates the release of adrenaline. This is the ‘fight or flight’ hormone that gets released whenever we’re scared, excited or stressed. Its job is to make us a little more physically able and works to enhance our focus (giving us almost a ‘tunnel vision’), to increase heart rate thereby delivering more blood and oxygen to the muscles, and to shut down/slow down the function of other organs. It appears that the adrenal gland is stimulated to fire as a response to the increased firing of neurons, which in turn is caused by the blocking of adenosine (ACTH – adrenocorticotropic hormone may play a role). This adrenaline helps make you feel more focussed and alert, but it’s also what can cause jitteriness and anxiety. Drinking caffeine may also stimulate your production of cortisol – the stress hormone which not only makes us more likely to feel stressed, but can also contribute to weight gain and snacking. Cortisol promotes the release of insulin, which is responsible for taking blood sugar out of the blood to be used by the body or stored as fat (note as well that something like a cappuccino will actually contain a lot of calories). This increase in cortisol also results in an increase in serotonin as the body attempts to balance the neurotransmitters. Many people will drink coffee first thing in the morning, which could be a mistake as the body is already high in cortisol and already ‘amped up’. Different people will be affected differently by caffeine dependent on numerous factors including weight. The average ‘half-life’ of caffeine is five to six hours meaning that’s how long it takes for the effects to wear off. Interestingly though, women using oral birth control pills will take twice as long to break it down (the same is true just after they have started ovulating up until the end of their menstruation cycle). On the other hand, smokers will take half as long to process caffeine. In terms of the kick you get from caffeine, this will be impacts by the amount of caffeine you drink and how often you drink it. Over time we develop a tolerance for caffeine meaning that the effects are lessened and we have to drink more and more to get the same results. It may even be the case that the results wear off almost entirely (1). The precise mechanism through which this tolerance occurs is debated. One theory is that the number of adenosine receptors increases meaning you’d need more caffeine to block them. This might also suggest that your ‘base levels’ of tiredness would increase. It’s also possible that the adenosine receptors slightly change due to caffeine consumption. Furthermore, it appears that drinking caffeine over a long period can decrease norepinephrine receptors (an adrenaline-like hormone) as well as serotonin which improves the mood. This study suggests that high caffeine consumption can also reduce blood flow to the brain over time. All this also leads to withdrawal once you remove the caffeine that the brain has now come to rely on. It has even been suggested that the reason we get brain fog in the morning – and feel so much better when we wake up and have that first coffee – is that we are actually experiencing withdrawal. It could be that that first cup of tea is just curing a problem that it created itself in the first place. So those are the facts. That’s how caffeine interacts with the brain and body. What you choose to do with this information is up to you, but just remember: the caffeine you drink is having profound and sometimes difficult to predict effects on both your brain and your body. Use with caution!